At dinnertime, there’s just one way to order: the all-you-can-eat meat-and-vegetable platter for $16.90 per person or the vegetarian platter for $14.90. Patrons of the Blue Nile, Taste of Ethiopia or Windsor’s Marathon are familiar with the routine: Little heaps of fabulous dishes are placed on a giant circle of spongy injera bread, which everyone shares. More injera is alongside, folded like napkins, to use as your eating utensil until you’re ready to eat the tablecloth. At lunchtime, you can keep the meal smaller and order one meat with two vegetables for $7.95. But what makes Addis Ababa different from other Ethiopian restaurants is that it has a take-out menu. 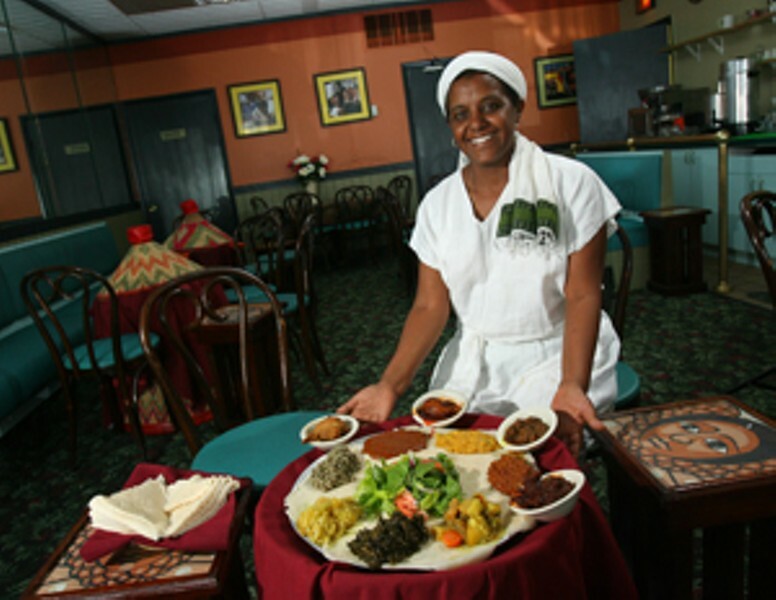 Twelve ounces of the vegetable dishes are $2.95, meat $3.75, injera free. You could create your own feast at home or for a picnic. It’s open every evening and for lunch Tuesday through Saturday.